On September 3rd, 1977, The Grateful Dead headlined one of the largest and most musically successful concerts of all time at Raceway Park in Englishtown N.J. In addition to the Dead, who had just completed its legendary Spring / Summer 1977 tour featuring a batch of new material from Terrapin Station, the show also included the Dead family’s New Riders of the Purple Sage and the good-time, southern rock Marshall Tucker Band. This tribute extravaganza features healthy “doses” of selections from each band’s sets that day with a relaxed, festival style program. Back in 2005 I joined this legendary band of gypsy cowboys. Below is the press release, short Bio. and history of the band that pretty much sums it up. I can tell you this already; it's going to be a rockin' rodeo of a ride. Also here are some great web sites for all things NRPS our official site is www.thenewriders.com, and for all things historical and to buy shirts and archive CDs check out www.nrps.net To book the New Riders contact Blue Mountain Artists. The New Riders of the Purple Sage Ride Again. The long-awaited return of The New Riders of the Purple Sage has fans in a psychedelic head spin. Original members David Nelson (guitar and vocals) and Buddy Cage (pedal Steel) along with Michael Falzarano of Hot Tuna (guitar, mandolin and vocals), Johnny Markowski of Stir Fried and The JGB (drums and vocals) and Ronnie Penque of Ripple and The JGB (bass and vocals) will treat the Northeast to a tour with shows throughout the Tri-State area, New York City and The Harvest Festival in upstate New York. Once called the greatest cosmic, psychedelic-country folk rock & roll band in the universe, the new lineup of NRPS will revive its legendary reputation in early October and will continue through December, into the new year and beyond. Veterans David Nelson and Buddy Cage have put together a smokin’ band to perform its timeless music to fans both old and new. "David and I will be playing our NRPS catalog," says Buddy Cage who replaced Jerry Garcia on pedal steel in the band's earliest lineup in 1971. 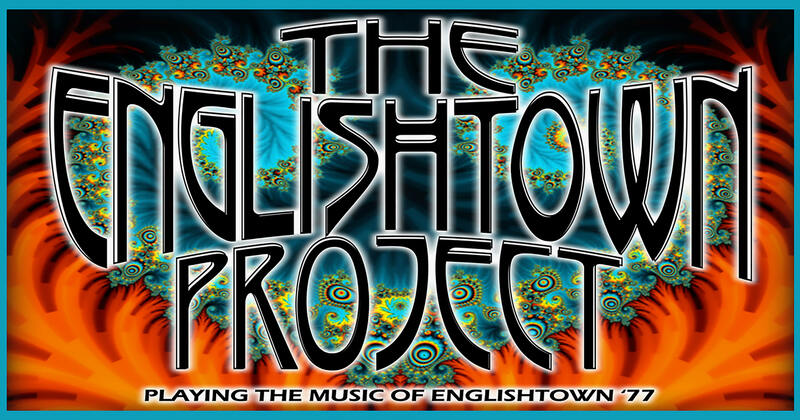 John Dawson along with original bass player Dave Torbert and drummer Spencer Dryden have passed away and are now a part of the ethereal band. They will undoubtedly be smiling down as their music lives on. Formed in 1969, The New Riders were signed to Columbia Records in 1971 by Clive Davis and its eponymous first album, New Riders of the Purple Sage, was released in September of that year to widespread acclaim. For the next 11 years the band continued to tour and release over 12 albums, selling over 4 million records. The two bands that helped define country rock as we know it are The Eagles and The New Riders of the Purple Sage. If the Eagles were the Beatles of country rock, then The New Riders of the Purple Sage were The Rolling Stones – rockin', rowdy and genuine. The New Riders of the Purple Sage was initially envisaged as a part-time spin-off from the Grateful Dead. Jerry Garcia (pedal steel guitar), Phill Lesh (bass) and Mickey Hart (drums) joined John Dawson (guitar, vocals) and David Nelson (guitar). 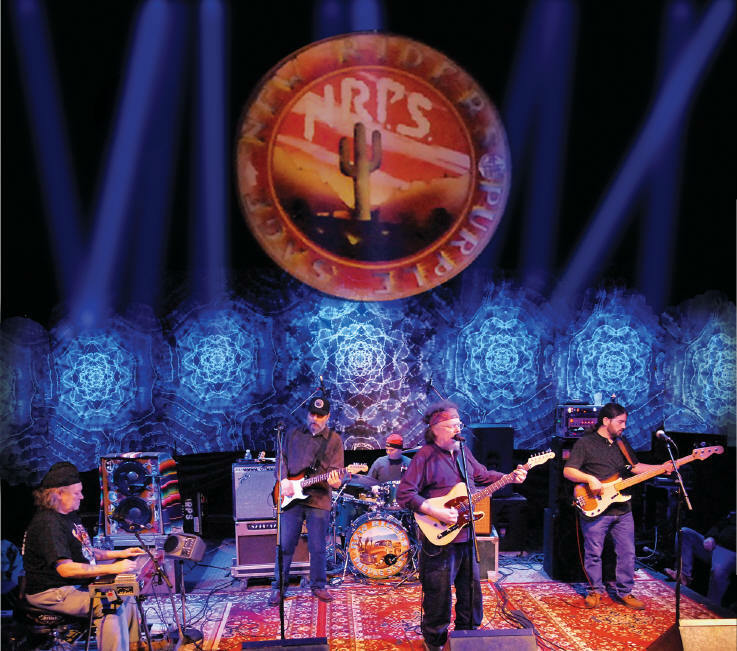 Although early live appearances were viewed as an informal warm-up to the main attraction, the NRPS quickly established an independent identity through the strength of Dawson's original songs. The band signed a recording contract in 1971 with Columbia, by which time Dave Torbert had replaced Lesh, and Spencer Dryden, formerly of Jefferson Airplane was installed as the group's permanent drummer. Garcia remained both a member of The Dead and a New Riders, until he found himself overcommitted, and Buddy Cage, previously with Ian and Sylvia’s Great Speckled Bird, replaced him. This formation recorded four albums. Three in the studio and one (Home, Home On The Road), live - from November 1971 until February 1974. Their sound became more assertive, which brought commercial rewards with he highly popular The Adventures Of Panama Red. After February 1974. Torbert departed to form Kingfish and was replaced by the vastly experienced Skip Battin, formerly member of The Byrds. This line up released Brujo and Oh, What A Mighty Time. Battin then left again, to join The Flying Burrito Brothers. In 1978 Dryden gave up playing in order to manage the band. The New Riders were dissolved following the Feelin’Alright album, after David Nelson left. Then Dawson revived and carried the NRPS torch throughout the 1980s and early 1990s until he retired to the hills of Mexico do to on going health problems.... Nelson, meanwhile, resumed his association with the Grateful Dead, playing in the Jerry Garcia Acoustic Band, Buddy Cage went on to become a much sort after studio and live performer working with such musical giants as Bob Dylan on Blood On The Tracks. The New Riders of the Purple Sage blended country, rock and folk elements like no other. A worthy companion to the parent act’s lauded American Beauty. What can I say about Hot Tuna that hasn't already been said or that you don't already know? Not much. But just in case you've been on safari in the outback for the past 40 years or so, I'll give you the long and short of it. 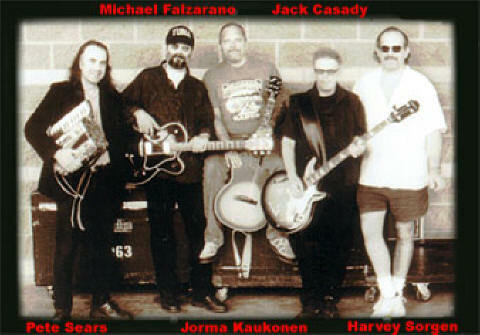 Hot Tuna was started by Jorma Kaukonen and Jack Casady, two of the finest musicians on the planet. They started out together in the Jefferson Airplane and founded Hot Tuna in 1969. While still in the Airplane they played out as Tuna, but soon left the Airplane to do Hot Tuna full time. I think it was 1970. They played nonstop for the next seven years, then disbanded in '77 until regrouping in 1983 for the ill-fated reunion tour (a whole other story). This is when I entered the wonderful world of Hot Tuna. Jorma and I had been playing together for a few years, and when he and Jack decided to put the band back together, they asked me to join. Not knowing what I was getting myself into, I said yes. I've now played with them on and off for over 20 years and nonstop from 1990-2002 -- through good times and bad. My love for the group has never wavered. What Jack and Jorma do together when they play music, with a band or as a duet, is truly magical. In the early 2000s they went back to touring as a duet called "The Original Acoustic Hot Tuna" they have now added Barry Mitterhoff on mandolin and occasionally drummer when they play electric. I always had fun playing with them. In my travels many fans ask me when and if the old band will tour again. The answer to that question remains to be seen. You never know, never say never. Jorma released a great solo album, My Blue Country Heart, which was nominated for a Grammy -- no small feat. That CD was followed by a few more solo releases. Most recently he releasted I Ain't In No Hurry on which he covers my song When There's Two There's Trouble. Jack released a solo album, Dream Factor. In 2011 Hot Tuna released their first studio album in 20 years called Steady As She Goes. I released two solo albums, The King James Session and We Are All One and will be releasing a new album in late 2014 called I Got Blues For Ya. Well, I hope that clears things up a bit and brings you up to date. I started The Memphis Pilgrims in 1987. A friend decided to throw a party on Elvis’ ten-year death-a-versary in New York where I’d moved the year before after having spent 10 great years in San Francisco. I thought The Memphis Pilgrims was a great name for the band because Memphis, the home of Elvis, is also the birthplace of rock ‘n’ roll in my opinion. I think every music lover should make a pilgrimage there at some point to see Graceland, Beale Street, Sun Studios and the like. Anyway, I remember that first show clearly. The drummer I hired called to say he couldn't make it, but was sending another drummer to do the gig. His replacement showed up with a broken leg and cast from the bottom of his right foot to his groin. The bass player never showed up at all, and I got a bass player friend-of-a-friend to play who happened to be there. It turned out to be a lot of fun despite the fact that I had never met anybody in the band and never saw them again. I’d played on and off with Hot Tuna since 1983. While I was touring with them, I met Michael Slater and Steve Sacher, who later joined The Pilgrims. Shortly thereafter we got underway full time. The band had many drummers, but unfortunately I’ve forgotten many of the names over the years. One drummer that I remember, however, we nicknamed Happy (Bobby Harris). He had a day job as a window washer for many of New York's skyscrapers. He'd rock out all night and drink and party like the rest of us, then somehow manage to keep his balance on the scaffolding the next day. 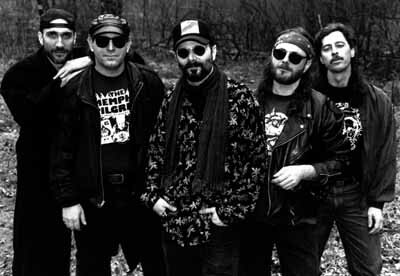 The Pilgrims continued to play together for a few years all over New York City and the surrounding area before recording a five-song EP. Then in 1989 I hooked up with Hot Tuna again full-time and put The Pilgrims on hiatus until the early ‘90s. Although I’ve always loved playing in Hot Tuna and have both written and co- written many songs for the band, I still had a body of work that wouldn’t fit in the Tuna format. The Memphis Pilgrims allowed me to showcase that material while collaborating with other musicians. The hiatus ended with a new version of The Memphis Pilgrims which included Hot Tuna drummer Harvey Sorgen, bassist Steve Rust, guitarist Jimmy Eppard and eventually keyboardist Professor Louie. We worked often during my off time from Hot Tuna. With The Pilgrims, I recorded an album of 12 of my songs, Mecca, for Relix Records in 1997. It got great reviews and sold well, but along the way Relix changed hands and the album went into out-of-print limbo. Then Right Arm Records came along and offered to re-release it. The original 12 tracks on Mecca feature Sorgen, Eppard and Rust along with Danny Lewis of Gov’t Mule who many people refer to as the 5th Pilgrim as he played on most of the tracks. I was also joined by Jorma Kaukonen and Pete Sears of Hot Tuna, Larry Packer of Cat Mother and the All Night News Boys (the only band to be produced by Jimi Hendrix and one of my faves from the ‘70s) and Dave Castiglione on sax. I’ve remastered this re-release. A few years back I was commissioned to write and record for an ABC Movie of the Week about the controversial Chicago Bulls basketball player Dennis Rodman. So I gathered The Memphis Pilgrims went into the studio and we wrote, recorded and mixed what became the song "Bad As I Wanna Be". Although ABC decided not to use “Bad As I Wanna Be” (King Radio Records), I think it rocks just the same. In the end, the producers were looking for something a bit lighter. That’s Hollywood for you. But hey, the director loved it, and I got a good song out of the deal. There have been many fine musicians who have spent time in The Memphis Pilgrims over the years and who have helped me with my vision for this band. I want to thank them all for their help and support on this journey – for without them it would not have been realized. This is a project that started under a full moon, hence the name. My good friend and great slide player, Kerry Kearney, and I had talked about doing some recording together. He had just taken over a music store in Brooklyn called "King James Music." There is an empty flat upstairs with two great sounding rooms. We thought that this might be a good place to record, so I called up my friend Danny Sheehan who has a mobile recording setup. He came down from Woodstock and set his gear up in one room, and we set up in the other. Over two nights we recorded a bunch of songs I'd written and some that Kerry and I had written together. The The King James Sessions has now been re-released on Hypnotation Records . In addition to the two of us playing guitar, it features Eileen Murphy on drums, Frank Celenza on bass, Tony Campo on accordion, Charlie Wolfe on harmonica, Jimmy Flimming on mandolin, Jeff Naimoli on percussion, Professor Louie on accordion and organ, Pete Sears on piano and Kane Daily on dobro and acoustic slide guitar. We had a gas recording this stuff, and I think it comes through in the tracks. Hopefully you'll feel the same. One final note: Although we didn't know this at the time, the upstairs flat is apparently haunted. We must have awakened the ghost that lives there because now doors are slamming, bells are ringing and the floor boards are creaking all the time, especially at night. Kerry had someone who knows about supernatural things come in to confirm this. Who knows -- maybe he or she well bring us good luck. This is a band I play with form time to time. Louie and I have been friends for some time now. He was also the keyboard player on all of The Memphis Pilgrims live shows. I recorded a version of my song "Last Train Out" on their album Flying High which features the legendary keyboardist from The Band, Garth Hudson. I have since re-mixed and re-mastered the song and it now also appears on my CD We Are All One. You should check out Woodstock Records for more info on the band as well as my CDs and the other cool albums and artists they have on the label. This is Kerry's band, and I play with them whenever I can make it. I hope to see you there. Check out his website for more info or my tour page for show info. I still chuckle a little when someone refers to Jorma and I as Kaukarano Here's how that began. Jorma and I had toured around as a duet since the late '70s when we weren't touring as Hot Tuna. Some time in the early '90s Jorma's sister-in-law, Ginger Lee, who worked in our management office at the time began to refer to us as Kaukarano. It sounded and looked cool to us, and we thought it was a funny way to combine our names. At first it was just the name that they put on the cover of our tour books. But one day we decided to make up some T-shirts with that name on them for fun. They sold well so we made another. There never was an act called Kaukarano per se, but people started to refer to us that way. Some fans were upset about this. I think they thought that we were trying to ace out Jack or something like that. This was definitely not the case. Case in point: in all my years of playing with Jorma, I can count on one hand on one finger the times we played a show with a bass player other than Jack Casady. That's a fact. It was only when Tuna wasn't touring that Jorma hired me to come along and play guitar and mandolin on his solo shows. For the most part we had a blast. This also gave Jorma a chance to play some Dobro, lap steel guitar, and for a short while, to try his hand at pedal steel. I think we played one show where he played the pedal steel on a song or two before realizing that this might be best left to the professionals. I just think it's funny how something can become real without even trying to make it so. I was recently on the road down south and a Tuna fan came up to say hi, and he had on a vintage Kaukarano T-shirt -- the one with the two boots on it. I had to smile. Just one more note on this, and this I really love. About a year ago I was looking though "The Rolling Stone Encyclopedia of Rock & Roll," and there in the Hot Tuna section it reads "in the early '90s Jack Casady toured with The Jefferson Starship: The Next Generation while Kaukonen traveled with Falzarano in a musical aggregation called Kaukarano." And there you have it. Back in the 90s when we weren't touring as Hot Tuna, Kaukarano or Jorma solo, Jorma, Pete Sears and I toured as The Jorma Kaukonen Trio. 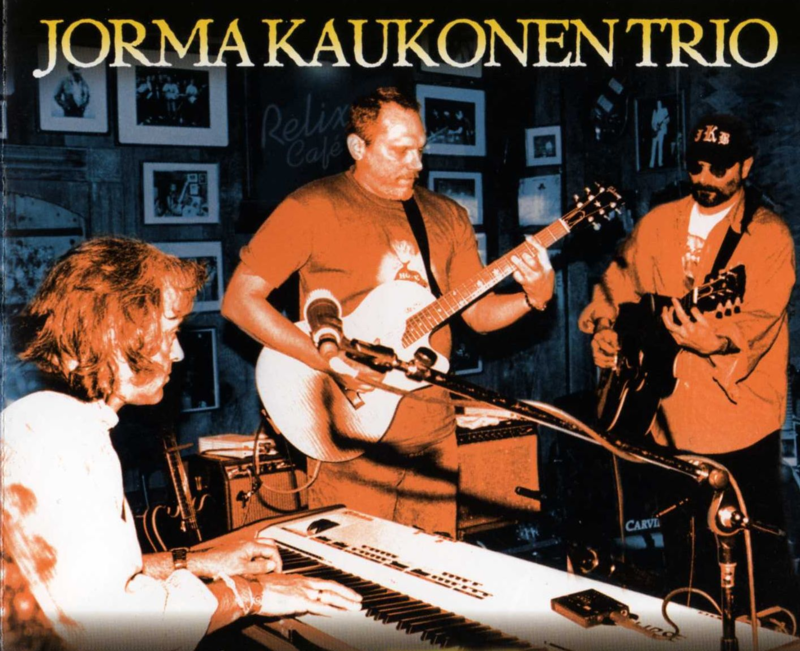 We released a live album, The Jorma Kaukonen Trio Live, and a studio album under Jorma's name called Too Many Years. They are both available through Relix Records and are representative of what we do together. Occasionally we add drummer Harvey Sorgen and call ourselves The Jorma Kaukonen Band. When not touring with any of the above, Falzarano produces other artists and teaches guitar workshops at Jorma Kaukonen’s Fur Peace Ranch. He recently performed an original song “When There’s Two There’s Trouble” in the hit feature film “Blue Caprice” which was directed by Alexandre Moors and debuted at the Sundance Film Festival.